Although OpenOffice Basic is not the most powerful and flexible programming language out there, you can still create some nifty solutions with it. For example, with a simple macro and a database, you can add a reminder feature to help you keep tabs on your deadlines. How about a macro that lets you update your Identi.ca or Twitter status directly from within OpenOffice? If this sound good, then read on. As a busy professional, you might already have a calendaring solution that helps you keep tabs on your tasks. However, if you spend most of your time in OpenOffice, you might want to add a simple reminder feature that alerts you to upcoming events and overdue tasks every time you launch the productivity suite. To do this, you need two things: a simple database for storing tasks and a macro that pulls the data from the database and displays it in a window. To start, create a new OpenOffice Base database called TaskDB. When you create the database, make sure that the Yes, register the database for me option is selected. Once the database is created, switch to the Tables section and create a new table in the design view. Now add at least three fields: ID (INTEGER primary key), Task (VARCHAR to store task descriptions), Date (DATE to store deadlines), and Done (BOOLEAN to mark tasks as done). Then save the table under the tasks name (Figure 1). Once the database is in place, you can start working on the macro. In OpenOffice, choose Tools | Macros | Organize Macros | OpenOffice Basic, press the Organizer button, and switch to the Dialogs section. Now select an existing library (Standard is a good choice), press New, give the dialog a name (e.g., "Dialog1"), and press the Edit button to open the created dialog for editing. To add a list box to the dialog window, use the List box control. Now switch to the BASIC module and enter the macro in Listing 1. First, the macro establishes a connection to the TaskDB database (lines 3--5). The macro then initiates the Dialog1 dialog window and the ListBox1 field (lines 7--12). 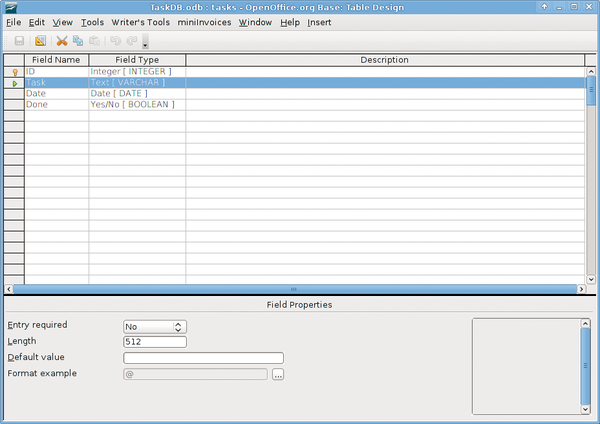 Next, the macro pulls data from the tasks table with the SQL query (line 13). This query selects the Task and Date (SELECT ""Task"", ""Date"") columns and obtains records that are not marked as Done (WHERE ""Done""='No'). For each record, the query compares the value of the Date field with the current date. If the value is higher than the current date, the Status field remains blank, but if the value is lower than the current date, then the Status field is set to OVERDUE. Finally, the query sorts the data by date in ascending order (ORDER BY ""Date"" ASC). Next, the macro executes the SQL query and populates the list box with the fetched data (lines 14--19). To run the macro every time you launch OpenOffice, choose Tools | Customize, click on the Events tab, and select OpenOffice from the Save in drop-down list. Select the Open Document event, press the Macro button, and select the ShowTasks macro. Press OK to save the settings and close the window. That's all there is to it. Now you can view the list of upcoming events and overdue tasks every time you launch OpenOffice. Microblogging services like Twitter and its open source alternative, Identi.ca, are all the rage these days, and a slew of high-quality clients are available for both services. However, leaving the convenience of OpenOffice every time you want to update your status can become an annoyance. A simple microblogging tool within OpenOffice provides a solution to this problem. Using cURL, you can create an OpenOffice Basic macro to obtain the required data from the user. Then you can construct a command string and pass it to cURL with the Shell routine. First you have to create a dialog containing three text boxes for entering a status message, username, and password (Figure 2). Also, you need a button that triggers the rest of the macro. When adding the button to the dialog, make sure to set its type to OK in the Properties panel. Now use an existing module or create a new one and enter the macro in Listing 2. 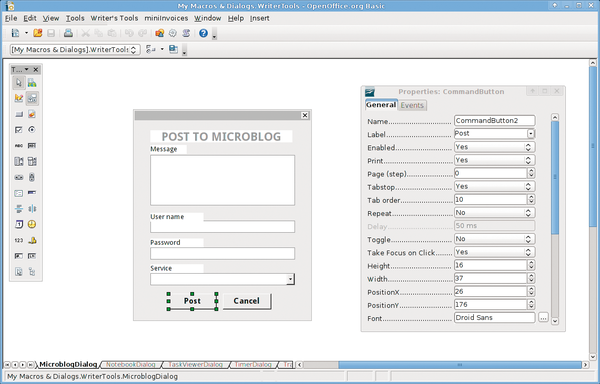 Figure 2: Creating the microblogging dialog. Similar to the previous example, the macro starts by initializing and displaying the dialog. Once the user has entered the data and pressed the OK button, the macro obtains the content of the dialog fields. The interesting part here is the StatusMsg statement (line 12). The Join routine does the exact opposite of Split: It glues pieces in the array into a string with the use of a specified delimiter. So, the StatusMsg = Join(SplitStr, "%20") statement turns the SplitStr array into the following string: "Weather%20is%20good%20today". Similarly, the statement converts other special characters into their URL-encoded versions. The macro then puts all the pieces together and constructs the StatusUpdate string that is then passed to cURL by the Shell routine (line 19). 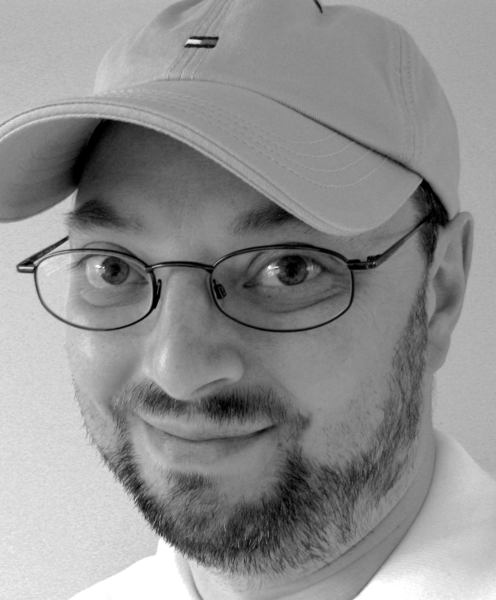 Your microblogging tool is ready to go, but you can still improve a few things. For example, you can tweak the macro so that it saves your status messages and dates in a OpenOffice Base database. This effectively turns your microblogging macro into a simple backup tool. Start by creating a simple database called MicroblogDB that contains a table with three fields: ID (INTEGER, primary key), Status (VARCHAR to store status messages), and Date (DATE to store the current date). The Date field should use the YYYY-MM-DD format (the ISO format). Now save the table under the file name microblog. Next, modify the macro (Listing 3) so that it now consists of three additional steps. First, it converts the current date value into the YYYY-MM-DD format (line 20). Next, the macro establishes a connection to the registered MicroblogDB database (line 23). Finally, it constructs an INSERT SQL query that inserts the status message and the formatted date in the database (line 24).